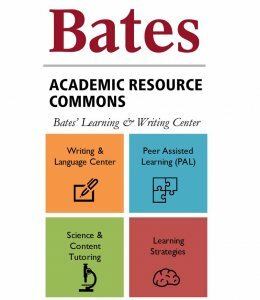 We are Bates students who connect you with the resources available to help you achieve academic success. We are Peer Tutors, Resource Representatives, Technical Writing Assistants, Peer Assisted Learning Leaders, Peer Writing & Speaking Assistants, Writing Fellows, and Student Managers. We provide both individual one-on-one support in ARC, as well as running drop-in and group sessions. We help you identify what resources are available to you, and how to access them. You’ll find us at the front desk of both ARC and the Writing Center. We support student writers in Biology by designing and facilitating weekly out-of-class sessions that address approaches to writing assignments and assist students with their writing process. We attend the section of the class we are supporting and facilitate learning in out-of-class sessions using strategies that build readiness and comprehension in traditionally difficult courses. We collaborate with faculty to support students in individual sections of First-Year Seminars W2 and W3 level courses. We have completed Bates coursework on the theory and practice of writing, writing tutoring, and the teaching of writing (Education s19); we continue to develop as writing educators through work that engages them with writing pedagogy. We are available to support students as writers, and faculty as teachers of writing. We develop and implement trainings for peer tutors, provide on-the-floor oversight of the Academic Resource Commons, and serve as liaisons to departments.